The Japanese Navy’s Special Naval Landing Forces (Kaigun Tokubetsu Rikusentai) are often likened to the U.S. Marines. However, the analogy is not a particularly good one. Like the Marines, the SNLF specialized in amphibious landings and in defending coastal positions. However, the SNLF were sailors trained as light infantry and organized into battalion-sized units led by naval officers, whereas the Marines were a distinct service within the Navy Department that carried a full complement of heavy weapons (including artillery, tanks, and ground-support aircraft) and were organized into regiments and divisions under their own officers. The differences are reflected in the combat history of the services. The SNLF avoided assaults on heavily defended positions, attempting instead to leapfrog opposition and land supplies and reinforcements as quickly as possible. This worked extremely well in the early months of the war, when the Japanese had nearly complete freedom of movement and there were not nearly enough Allied troops to cover every vulnerable point. The exception was Wake, where the SNLF never even made it into their boats on the first attempt and took heavy casualties in the second. The U.S. Marines landed against light opposition in their first few campaigns in the Solomons, but suffered heavy casualties in the Central Pacific taking heavily defended atolls. The Special Naval Landing Forces were a relatively recent development in the Japanese Navy. Japanese warships from 1897 on designated a small portion of their crew (usually less than a third of their complement) as a landing force (rikusentai). These sailors were equipped with small arms and received very basic infantry training so that they could be used for armed shore parties. These landing forces saw service against the Russians during the Russo-Japanese War of 1905 and against the Germans in the First World War, generally landing by surprise against little or no opposition. However, their most extensive use was in China, where they often formed semi-permanent garrisons. One such garrison was located at Shanghai from 1927 on. 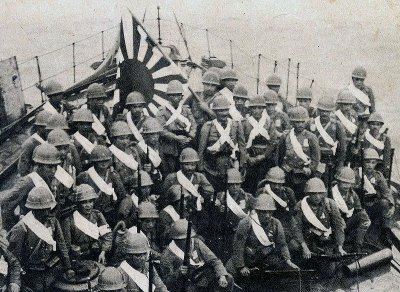 The Shanghai naval landing party soon developed close connections with Japanese paramilitary forces in Shanghai. The Navy and Army were unusually cooperative in the development of amphibious doctrine, holding joint exercises in 1922, 1925, 1926, and 1929. The lessons learned from these exercises were distilled into the "Outline of Amphibious Operations" (Tairuku sakusen kōyō) of 1932, which became the Japanese bible of amphibious warfare. However, in February 1932, the Japanese rikusentai at Shanghai clashed with Kuomintang troops and took heavy casualties. The Navy responded by authorizing two permanent specialized landing formations on 1 October 1932. These became the Special Naval Landing Forces. Sources are inconsistent, but indications are that only one of the authorized forces was actually organized, by redesignating the Shanghai rikusentai. The Shanghai SNLF had a unique table of organization, which by April 1945 authorized a strength of 3645 officers and men heavily armed with antiaicraft weapons (including 20 120mm AA guns, 8 80mm AA guns, and 120 light AA guns) and a handful of tanks. Four more units were authorized on 15 October 1936, one for each of the Japanese naval districts (Yokosuka, Kure, Sasebo, and Maizuru). Unlike the Shanghai SNLF, which was equivalent to a regiment in strength, the district SNLFs were organized as battalions, with an authorized strength of 539 officers and men organized into two rifle companies and supporting elements. Each rifle company had four rifle platoons and a machine gun platoon. Each rifle platoon had four nine-man squads and the machine gun platoon had three machine gun squads and an ammunition squad. There were no weapons heavier than medium machine guns, and doctrine emphasized unopposed landings. Following the escalation of hostilities in Shanghai in August 1937, the Navy organized additional SNLF battalions, which were often organized for a specific task and then disbanded. Organization was highly variable but generally retained the structure of two rifle companies and an infantry gun company. In addition to the Shanghai SNLF, three other SNLF from this period remained active throughout the war. These were the Sasebo 8 SNLF (with five rifle companies and an infantry gun company), Yokosuka 4 SNLF (with five rifle companies of six platoons each), and Maizuru 1 SNLF (with 1316 officers and men organized into six rifle companies of five platoons each). These three SNLF were large but relatively lightly armed, and they remained on Hainan on garrison duty throughout the war. In December 1937 the Navy authorized a TO&E for a combined SNLF headquarters for commanding two or more SNLF. This consisted of a bare headquarters without any supporting elements, which proved inadequate. On 12 July 1939 a new set of Naval Landing Force Regulations was published. These attempted to standardize the SNLF and provide for a combined SNLF headquarters with supporting elements adequate for its role. A standard SNLF numbered 1069 officers and mena and was fully triangularized, with three rifle companies, an artillery company, and supporting elements. Rifle companies had a headquarters platoon, three rifle platoons, and a machine gun platoon, and each rifle platoon had three rifle squads and a grenade squad armed with Type 89 "knee" mortars. The artillery company had two 70mm Type 92 howitzer platoons and two 75mm Type 41 mountain gun platoons. The SNLF also had three squads of engineers. Because the SNLF lacked the supply train of equivalent Army units, it was authorized a greater allocation of ammunition. The new regulations also provided for special mountain gun, tank, and chemical warfare companies that could be attached to an SNLF as needed. The special mountain gun company was equipped with the more powerful 75mm Type 94 mountain gun and could either replace the normal artillery company in an SNLF or serve as a central artillery unit for a combined SNLF. The special tank company consisted of a light tank platoon and three medium tank platoons. Additional tables of organization for a bewildering variety of gun companies were published shortly after the 12 July 1939 regulations, The effect was that each naval district organized its SNLF as it saw fit. Twelve such battalion-sized forces were organized by the time of the Pearl Harbor attack. As the war progressed and Special Naval Landing Forces more commonly found themselves in the defensive role, their armament shifted towards more machine guns and artillery (typically 46 machine guns, 8 120mm coastal defense guns, 16 80mm antiaircraft guns, 4 75mm antiaircraft guns, and a handful of light antiaircraft and antitank guns.) Two or more Special Naval Landing Forces could be combined into a Combined Special Naval Landing Force with a strength roughly equal to a regiment. A Special Naval Landing Force was typically led by a commander while a Combined Special Naval Landing Force was led by a captain or rear admiral. Naval units of this type are usually more highly trained and have a greater tenacity and fighting spirit than the average Japanese Army unit. This may reflect a predisposition by the elite American Marines to assume that "Japanese Marines" must also be elite. However, the Japanese Navy did not regard the SNLF as elite forces, but simply as sailors assigned to ground combat duty. The different assessments may also have their origin in confusion between the Special Naval Landing Forces and the less well trained and equipped Base Forces. As Japan lost the initiative in the Pacific, the Special Naval Landing Forces tended to be replaced with Base Forces (konkyochitai) and their subordinate Guard Forces (keibitai) which were often hastily organized before being rushed to Pacific bases.